Shoulder manipulation can be the right choice for you. Like surgery, it is generally considered when other options have failed. "Do I Need Shoulder Manipulation?" Your shoulder by design is a joint that has the capacity to move the arm in a wide range of motion across multiple planes and bear very significant loads while doing so. Any joint that has these attributes must by design be fairly complex. The name of the shoulder joint is known as the Glenohumeral Joint. At the very top of the arm bone (humerus), there is a "ball"-like end on it. This "ball" fits into a shallow socket known as the Glenoid Cavity (or Glenoid Fossa) that is located at the end of the shoulder blade (scapula). Picture a a loose, elastic shell that surrounds the whole joint, all the way around the socket - this is known as the Joint Capsule. Stabilizing the humerus to your core are numerous ligaments and tendons both inside and outside of this capsule. A shoulder that is considered for manipulation is a shoulder with a joint capsule that is inflamed and/or tight - usually the shoulder is a Frozen Shoulder, and can happen without apparent cause. Sometimes, this can happen after shoulder surgery, after an accident or as a condition brought on from diabetes. There are some shoulder cases where the capsule is very tight but there is little, if any, inflammation. Such cases typically occur from a major shoulder injury they have had in the past that has become chronic. This is basically termed as "Post Traumatic Stiffness". The Joint Capsules of such shoulders have little swelling but also very little movement or Range of Motion (ROM) due to a large amount of scar tissue in the capsule and surrounding tendons, ligaments and muscles. Post Traumatic Stiffness does not usually respond well to manipulation. Frozen shoulder associated with insulin-dependent diabetes does not respond well to manipulation under anesthesia, often refreezing within 2 to 3 weeks. If there is any history of postirradiation fibrosis, then this may well lead to loss of elasticity in the brachial plexus and put the plexus in jeopardy of a traction lesion. The elderly, frail, and osteoporotic should not be manipulated for fear of causing a fracture of the shaft or proximal humerus. *"Manipulation Under Anaesthesia | Shoulderdoc". Shoulderdoc.co.uk. N. p., 2017. Web. 19 June 2017. Shoulder manipulation is not effective unless you really do have frozen shoulder. This is why it is important to get to a physician and find out what is really going on - this is known as getting a proper diagnosis. Getting a proper diagnosis would also determine if your locked shoulder is referred pain or a side effect from another condition or disease (diabetes or lyme disease are two examples). This is less common but nonetheless, very serious. So yes, it is important to get a proper diagnosis - and even more important when pertaining to frozen shoulder. The goal of a Shoulder Manipulation is to increase the Range of Motion (ROM) of the shoulder joint. During a manipulation, the Joint Capsule will be torn by forceful stretching of the arm while you are sleeping (under an anaesthetic). A Shoulder Manipulation may involve arthroscopic surgery (aka keyhole surgery) where 2 or 3 small incisions are made in the shoulder to insert an arthroscope and specialized releasing tools to reach the joint capsule location. ...The surgeon should stand at the head end of the table with one hand stabilizing the scapula in the resting position. The surgeon's other hand should then be placed in the patient's axilla such that the surgeon's forearm is resting against the whole of the inside of the patient's arm. First, abduction is taken to the patient's free limit, and then the patient is forcibly abducted while the scapula is maintained down in the anatomic position. The scapula must not move at any stage. This maneuver will rupture the inferior capsule. The shoulder is then forcibly adducted such that the affected elbow is pushed in front of the patient's chin to rupture the posterior capsule. Finally, forcible external rotation and internal rotation are added, but great care is taken here because it is during these final rotation maneuvers that a spiral fracture can be caused. Source: "Manipulation Under Anaesthesia | Shoulderdoc". Shoulderdoc.co.uk. N. p., 2017. Web. 19 June 2017. This risk includes any negative repercussions from the anaesthesia such as sickness, nausea, cadiac, respiratory or neurological problems. **Risk is quoted at less than 1% each. **There is up to a 30% chance of this happening. A shoulder manipulation should be considered with much the same gravity as surgery. As such, all risks, issues and concerns should be discussed with your physician before undergoing a shoulder manipulation. **Source: "Manipulation Under anaesthetic (MUA) and athroscopic capsular release (ACR)| Royal Berkshire, NHS Foundation Trust ". http://www.royalberkshire.nhs.uk, 2017. Web. 28 June 2017. Is The Shoulder Manipulation Procedure Painful? Yes, it is but you will be asleep and have a local anaesthetic injected in the shoulder to help reduce pain. The anaesthesiologist may numb your whole arm for a few hours after the operation in cases of sharp pain. You will probably be prescribed painkillers, and be ready to take the tablets as directed (probably when the pain levels start to get high). It is known by doctors and physical therapists that manipulation will increase shoulder Range of Motion (ROM) by ripping soft tissue at the cost of introducing more scar tissue into the shoulder. This added scar tissue can be very problematic, requiring quite a bit of physical therapy and often significant treatment post-manipulation. If not dealt with properly, your shoulder could end up in worse condition than before. This is why manipulation is only performed as a last resort. When considering whether or not to manipulate your shoulder, physicians carefully weigh the risks and pros and cons. Part of the consideration may very well be whether or not they think you will undergo the intensive physical therapy that is very important for successful recovery. You will probably suffer from an increase in pain for the first few weeks; this will probably affect your ability to do everyday activities - especially if the manipulation was done on the shoulder of your dominant hand. So be prepared for this, and have some help available for you after the operation. Pain after shoulder manipulation will be significant but should gradually decrease over time. With the decreasing levels of pain, you should be able to stretch and exercise more frequently and for a longer duration, which is VERY IMPORTANT. Normally the change in movement will occur withing 4 to 6 weeks after the manipulation is done. You will find certain movements get better more quickly than others - this is common. Getting the hand up behind the back is usually the last and most difficult movement to regain after manipulation. Regaining perfect range of motion is unlikely, but you might find that even small gains in ROM will improve your ability to do everyday activities. Those suffering from diabetes have a reduced chance of an optimal outcome. When Can I Drive or Return to Work? Generally speaking, most clients can start driving about 2 or 3 weeks after a manipulation. Before considering getting behind a wheel, ensure that you can manage all the controls and use the seat belt properly (attach/detach). The seat belt will probably be uncomfortable for a while, but it shouldn't cause harm to the shoulder. It is also best to start driving for short journeys only. Regarding a return to work, the time of return will depend a lot on the type of work you do. For desk jobs, you can probably return in a couple weeks. For jobs that involve heavy lifting or other manual work, it will probably be a month before you can return. Be sure to discuss this with your physician or physiotherapist for a go-ahead. When Can I Get Back to My Leisure Activities? Activities such as gardening, hiking etc are really dependent on the range of motion you currently have. Nothing is ruled out but a general rule to follow is to consult with your physiotherapist first. Low impact water activities are often considered a good idea to start with as long as you start out slowly. When walking, try to regain the natural swing of the arms as it will help improve your ROM without overstressing it. Do I Need To Wear a Sling After the Manipulation? 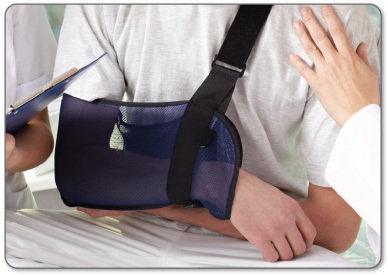 It is common to return from your manipulation surgery wearing a sling but it is important to know that the sling is really just there for your comfort (pain management). Pain will be present when you start your recovery and in many cases, the sling is really needed just to help reduce the pain for a while. Knowing that the whole purpose of a manipulation is to increase ROM, it is really a bad idea to keep the sling on all the time - the goal is for you to increase movement in your arm so do not keep your arm in the sling for a long duration of time without doing your exercises. Once you feel able, stop using the sling. I Can't Sleep Due to the Pain - What Do You Recommend? 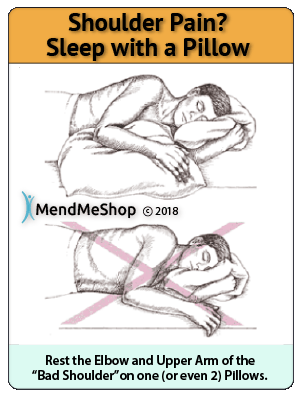 If your sleep position is on the side with your weight on your "good" shoulder (the one that WASN'T manipulated), put one or even two pillows in front of you and rest the elbow and upper arm of your "bad" shoulder (the one that WAS manipulated) on these pillows. This should help keep your shoulder pain level down so you can get to sleep. If your sleep position is on your back, it is recommended to try putting a thin pillow or rolled up towel under your "bad" arm. If it doesn't do the trick you might find sleeping on your side with the pillow supports is the better option to at least help you sleep. Natural steroid levels in the body are reduced at night which helps explain why some swelling induced pain and annoying issues such as throbbing arise once you go to bed. Furthermore, your body is now horizontal which alters blood pressure in the shoulder and arms - such seemingly minor changes can have a big impact on your ability to sleep. In some cases, anti-inflammatories are prescribed though we always recommend trying cold compression if you find you can't sleep due to throbbing or an increase in pain in the shoulder. What Do I Do About Surgical Wounds? If you didn't undergo arthroscopy, there won't be any wounds. If you have had arthroscopy, you will have dressings over the wounds, though there are likly no stitches as the wounds are almost always quite small. Keep the wounds dry until healed, typically 5 to 7 days. Once your shoulder manipulation is done, you will realize very quickly that it is very important to undergo an intensive physical therapy regimen as not doing so will greatly increase the chance that your shoulder will freeze up again. The exercises you are told to do are designed to try and maintain any increased ROM that you gained via the manipulation. You will be under strict order to exercise and stretch both at the clinic and at home, straight away! You will need to get into a habit of consistent, frequent exercises at home, multiple times per day for several months. As you progress, exercise goals will be changed. Ok, well the good news is that AidMyFrozenShoulder conservative treatments tools are highly effective for speeding up recovery from shoulder manipulation. Avoid Activities that Could Cause Re-Injury - While resting your shoulder it's also important to avoid all activities that could undo all the work done in the manipulation. This definitely includes pretty much any type of sport where your upper body is involved until you get the ok from your physical therapist or physician. Apply Cold As Needed - The application of a Cold Compress or Ice Pack will help you to manage pain after a manipulation while getting rid of swelling, inflammation and edema in your shoulder. Immediate pain relief and reduced inflammation can also relieve some of the pressure that's being placed on the soft tissue in your shoulder (impingement) and help you rest more easily at night. After the manipulation (once incision wounds - if any - are healed), start applying Deep Tissue Regeneration Therapy treatments. This enables you to use your own blood flow to maximize healing of damaged tissue, maintain healthy blood flow to your shoulder, decrease recovery time, and boost overall long-term healing. Stretch Your Shoulder, Often as Directed by Your PT and by Using Our Top 5 Frozen Shoulder Stretches - Undertaking a frozen shoulder stretching regimen frequently on a consistent basis will help to increase the Range of Motion in your shoulder over time. Before stretching, apply the Shoulder TShellz Wrap for a treatment session to "warm up the shoulder" (increase tissue elasticity, decrease chance of strain). After stretching, apply a Cold Compress or Ice Pack if any pain or swelling flares up from the stretching. The T•Shellz Wrap® is a registered medical device. These is an effective tool that can be used at home in conjunction with your physical therapy. Even when your physical therapy is over, you can use the T•Shellz Wrap® to continue your recovery treatments if you feel your recovery is incomplete. After surgery once the skin has healed over. Whenever you first notice pain and swelling to stop celluar damage, relieve pain, and decrease swelling. After exercise, workouts or activity of any kind to prevent flare-up of swelling..
DURING shoulder manipulation recovery phase (once the skin wound has healed over) to increase healing rate and minimize scar tissue growth at the shoulder location. Anytime BEFORE you feel you might undertake activity that will put significant strain on the injury area. (ie. first starting to drive again a couple weeks after a manipulation. Living with pain is never easy as it affects your entire lifestyle. Living with pain after an intensive manipulation is not easy either. After a manipulation we highly recommend treating yourself at home with our Shoulder TShellz Wraps before stretching to increase elasticity and reduce the chance of over-straining. Furthermore, the curculatory system boost gained by daily DTR Therapy treatments will enhance your recovery rate and get you back to an active lifestyle in a reduced time. Doctors and Surgeons are always improving the technologies used in manipulations, but keep in mind that manipulations introduce scar tissue, and recovery can be often disappointing - especially if you do not adhere to a strict and lengthy physical therapy routine. If you do wind up getting manipulation, know that rehabilitation at-home while attending regular physical therapy or doctor appointments is vital for your overall recovery. It is especially vital to the shoulder areas, as they consistently handle extreme forces (body weight). Consistent exercise and conservative treatment on a daily basis during your rehabilitation while working with your doctor, surgeon or physical therapist is key - and this is why you should seriously consider maximizing your recovery by using the TShellz Wrap at home. AidMyFrozenShoulder.comstands out in this regard as our goal is to help you keep your shoulder healthy for the long-term in a cost effective manner. This might mean healing your frozen shoulder without needing manipulation. If you couldn't avoid shoulder manipulation, then our tools can also help you recover from this procedure more quickly and completely..
We strongly believe that we can help you, and we have thousands of happy clients to back this claim. You are welcome to try our products for a 60 day period.. If you are committed to following the treatments outlined in the product instructions we are very confident that our TShellz Wraps and Cold Compresses will aid you immensely. If you do not receive the benefits that countless of our other customers have experienced from our products, call us, mail the product back to us and we will provide you with a full product refund.